Famous Talmudic commentator of the first half of the fourteenth century. He received his name from the city of Seville; but was living at Alcolea de Cinca in 1342. He was gifted with a clear, acute mind, and was a pupil of Aaron ha-Levi and Solomon Adret at Barcelona, although it is doubtful whether he studied under Meïr ha-Levi Abulafia also, as some scholars think (Perles, "R. Salomo b. Abraham b. Adret," p. 59, Breslau, 1863). He was engaged in a controversy with Rabbi Dan Ashkenazi, who had emigrated to Spain. Yom-Ṭob's voluminous works include valuable novellæ on many of the Talmudic treatises, and commentaries on the writings of Alfasi and certain works of Naḥmanides. His published novellæ include those on 'Erubin, Ta'anit, Mo'ed Ḳaṭan, Ketubot, and Baba Meẓi'a (Amsterdam, 1729; Prague, 1810), Ta'anit and Mo'ed Ḳaṭan (Prague, 1811), Ḥullin (ib. 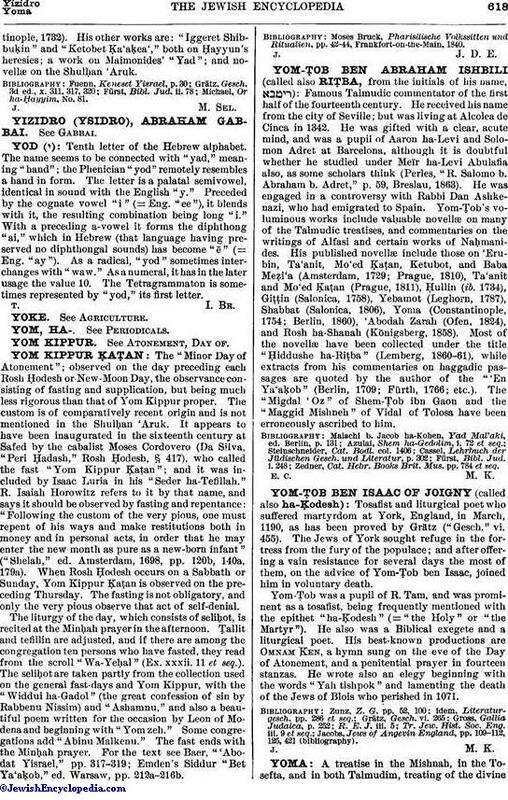 1734), Giṭṭin (Salonica, 1758), Yebamot (Leghorn, 1787), Shabbat (Salonica, 1806), Yoma (Constantinople, 1754; Berlin, 1860), 'Abodah Zarah (Ofen, 1824), and Rosh ha-Shanah (Königsberg, 1858). Most of the novellæ have been collected under the title "Ḥiddushe ha-Riṭba" (Lemberg, 1860-61), while extracts from his commentaries on haggadic passages are quoted by the author of the "'En Ya'aḳob" (Berlin, 1709; Fürth, 1766; etc.). The "Migdal 'Oz" of Shem-Ṭob ibn Gaon and the "Maggid Mishneh" of Vidal of Tolosa have been erroneously ascribed to him. Zedner, Cat. Hebr. Books Brit. Mus. pp. 784 et seq.